ARCHIVE - News/Updates 2013-2014 - University of the Philippines Alumni Association in America, Inc.
Read the updated news article by UP alumnus, Joseph Garbanzos, which was originally published in the Filipino Press on July 19, 2014 for highlights of President Pascual's speech and his vision for the UP system. 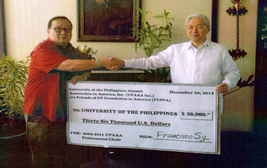 Dr. Francisco S. Sy, UPAAA President, 2007-'09 delivered the check of $36,000 to UP President Alfredo Pascual on December 20, 2012. Fund was raised from the last three conventions (2007, 2009 and 2011) for the UPAAA Professorial Chair Endowment Fund which will rotate every 2 years to an outstanding faculty member in UP Baguio, UP Visayas and UP Mindanao. 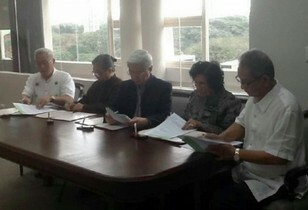 (L-R) Erlinda Rojas-Santos, Luz Sapin Micabalo, Romulo Aquino, Elizabeth Reyes Ilagan. Rightmost is Mrs. Necie Aquino.